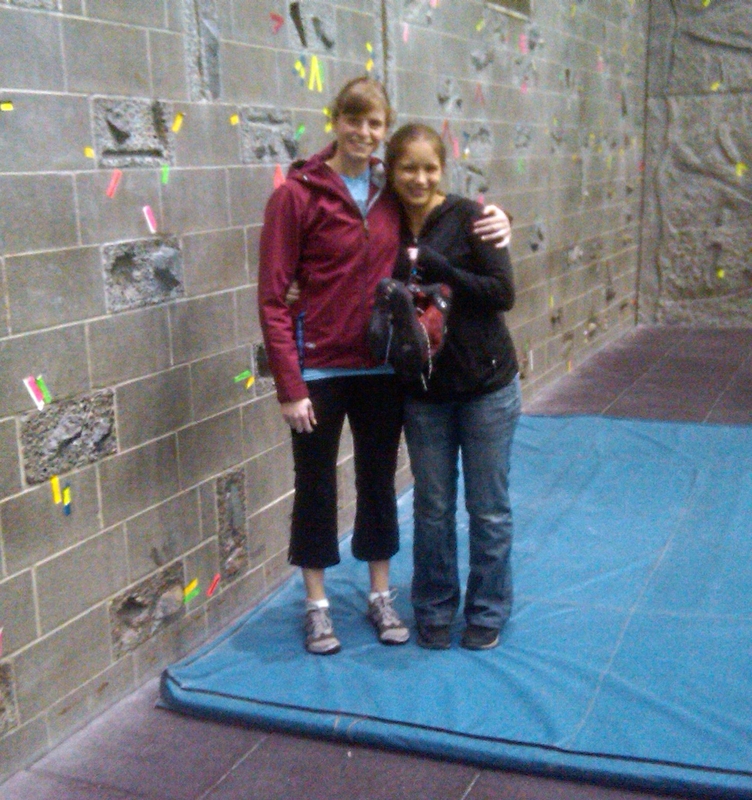 Amie and I after an awesome afternoon of climbing! After reading posts by Brendan, Elizabeth and Dave about what it means to be a climber, I spent a good bit of time pondering the concept of identity and the difference between saying, "I am a climber" and "I love climbing." The differences, though subtle, are important. One phrase implies an effect on identity, and that can be incredibly complicated. It got me thinking a lot about how I've defined my own identity in the past, and brought back some slightly painful memories. This past weekend, I had the chance to climb at the gym where I first donned a pair of rock shoes - the Lindseth Climbing Wall at Cornell. I went with Amie, a high school swimming friend I'm convinced will change the world someday. After spending so many hours in pools with her as teenagers, it was amazing to be able to share climbing with her. She was a perfect partner. It was also a joy to get back to my climbing roots, and back to where my excitement for the sport came from. 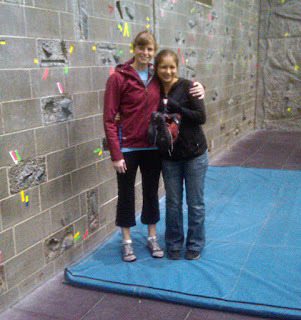 It certainly didn't hurt that, in addition to climbing for the first time with one of my best friends, I ran into the instructor who taught my first climbing class, Women's Basic Rock! My passion for climbing ebbs and flows - something I've learned to accept. I don't remember feeling love at first sight when I started in the fall of my senior year of college. Until that point, climbing was completely off my radar of possible activities; I didn't know what I was missing. As it turns out, the sport wasn't something I couldn't live without, just a really enjoyable way to spend a few hours. It made me feel strong and powerful. I didn't immediately fall in love, but climbing did awaken something in me; something that completely shook my world. "It isn't just a sport. It's my life. My Identity." The first semester of senior year marked the beginning of my 13th year as a competitive swimmer. Swimming was something I completely fell in love with; I was obsessed. I saved every single meet program and heat sheet to go over my progression and my competition from 1995 on. Practice was all I cared about. I switched teams in high school in favor of a coach with a reputation for devising some of the hardest workouts possible. (He was also a strong male figure in my life when I needed one, and an incredible human being.) I picked colleges to look at based on whether I could swim at them or not, and the quality of the coaching. I was never an all-star, never an Olympic or NCAA caliber athlete; swimming was just something I couldn't live without. And then, along came climbing. I don't think getting on the Lindseth climbing wall is the sole reason I started questioning my path - all of college was about learning and growing - but it was certainly one of them. After 13 years of eating, sleeping and breathing swimming, I was getting burned out. I didn't look forward to practices and couldn't find the motivation to push myself as hard as I used to. That November, I sat down with my coach for one of the toughest discussions I'd ever had. He told me to take a week off to really think about whether I wanted to finish out my senior year or not. I sat out an entire week of practices. It felt like an eternity for someone who'd only go without swimming one out of every seven days. I'd count down the minutes until each workout, thinking about my teammates about to jump into the water. They'd survived another day of classes, homework, sleep deprivation, and everything a college athlete has to manage, but I wasn't there. Despite the fact that the week of wasn't designed to end my career, just to help me reflect, there was a hole in my heart. It felt like I'd already lost something incredibly important, like someone or something had died. I made a list of things that comprised my identity over the course of that week. I described myself as a student, a woman, a fighter, a perfectionist, an individual, a sister, a daughter, a friend, and a competitor. I made a list of reasons I should swim. The list included things like, "because I love it, because I love achieving my goals, and because I love being part of a team." During that same week, I finished a roof route in the climbing gym for the first time, something I'd worked at for two months. (The picture on the right was taken right afterward!) I made peace with my relationship with swimming and finished out my senior year. It wasn't the best five months of my career, but I did it. Despite achieving a lifetime best in one of my events, the 100 breaststroke, during a time trial, I failed to make the team of swimmers who would represent Cornell at the Ivy League Championships that year. It's taken me a long time to understand that, though I might have been a swimmer, it didn't define who I was. I fought against it for so long, and the internal battle wreaked havoc on my performance in the pool. Swimming was something I did, something I was passionate about, and something I devoted an incredible amount of time to. But it was okay to stop caring so much, to release some of the pressure I put on myself, when the time was right. It didn't make me any less of a swimmer, or change who I was. In fact, when I moved to Alaska after graduation, I joined a masters swim team in Anchorage and even competed in a meet. It didn't last long, though...I found so many other things I wanted to try and had both the physical and mental freedom to do so. I'll always be a competitor. I'll always be happier when I'm active. I'll always love learning and trying new things. But there's a lot of pressure to live up to the expectations that come with saying, "I'm a swimmer," or "I'm a climber." That's why I hesitate to identify as anything but myself, anything but just plain old Katie. I want the things I'm passionate about to help me learn and grow, but not define my identity. I'd love to hear if this concept of identity and struggling with the phrase, "I'm a climber/runner/cyclist/skier/etc. resonates with anyone else. Do you have trouble calling yourself anything in particular? When do you decide when you're no longer in that category? nice, Chris! I know we'd talked about our mutual Cornell affiliation, but certainly didn't know you did a thesis and a lot of thinking about a topic like this. I think a lot of folks who spend extended periods of time involved in athletics, even a career, and then move on go through something similar. I'd love to read the thesis and/or talk more about it! 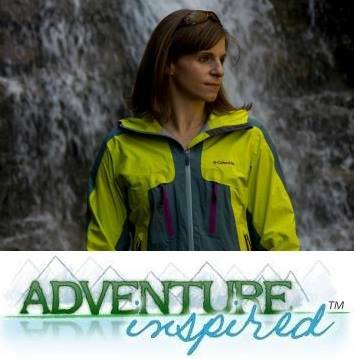 Aimee, thank you so much for sharing your story! I'm glad you found me, and based on the characteristics you attribute to yourself, I'm sure you'll be able to find a way to make your new endeavor from home work for you. I wish you all the best as well!